Just look at these beauties! 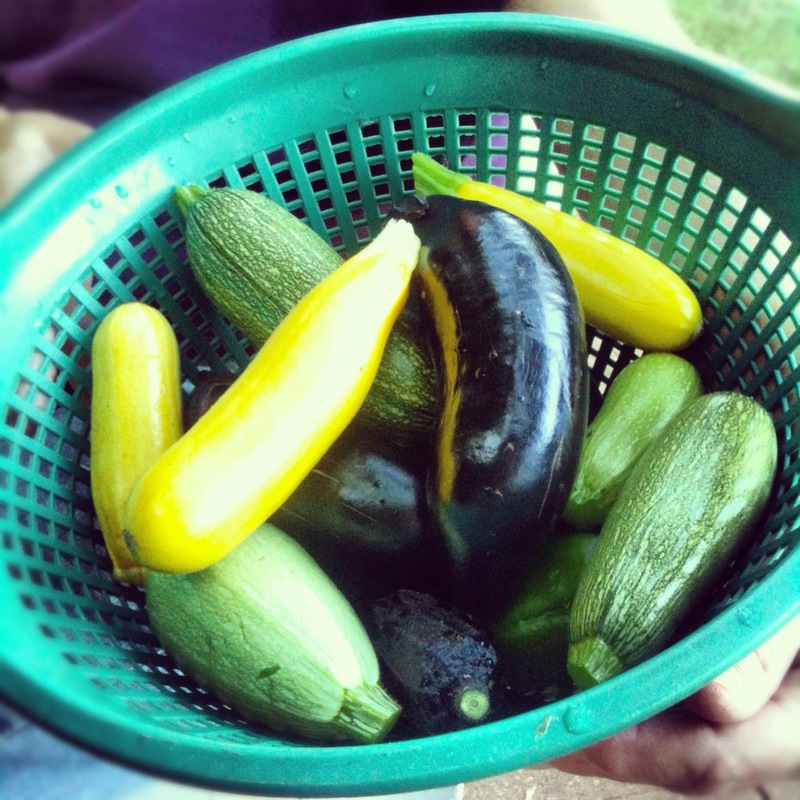 We’ve been eagerly watching the eggplant and zucchini all week, measuring their progress day by day, and trying to be ever so patient — but tonight, finally, it was time for the First Official Garden Dinner of Summer. Slice, olive oil and salt, grill, fresh basil, delicious. 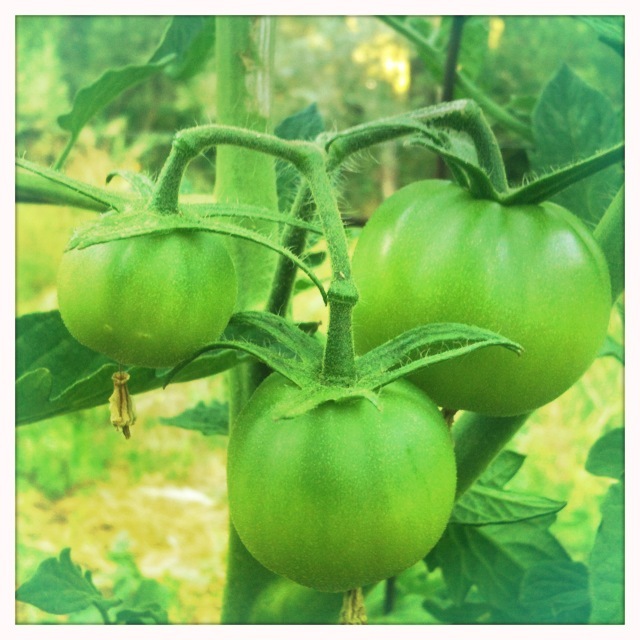 I’m especially excited about this heirloom German Cherry tomato I grew from seed. I never seem to start my seedlings early enough, but this year, with the help of a borrowed heating mat, success! 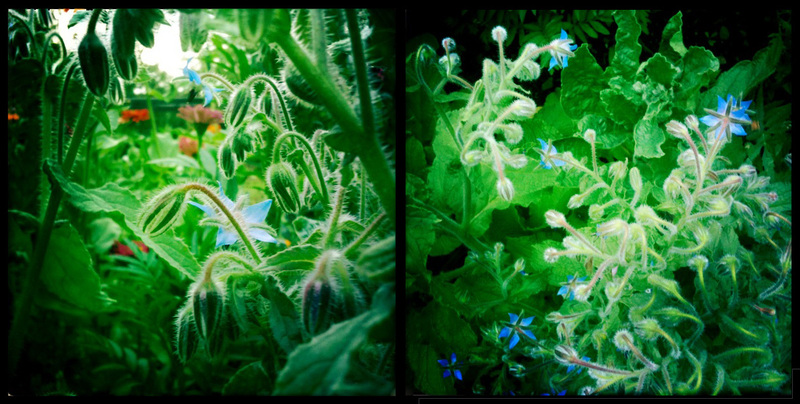 Happy gardening, and Happy Summer! 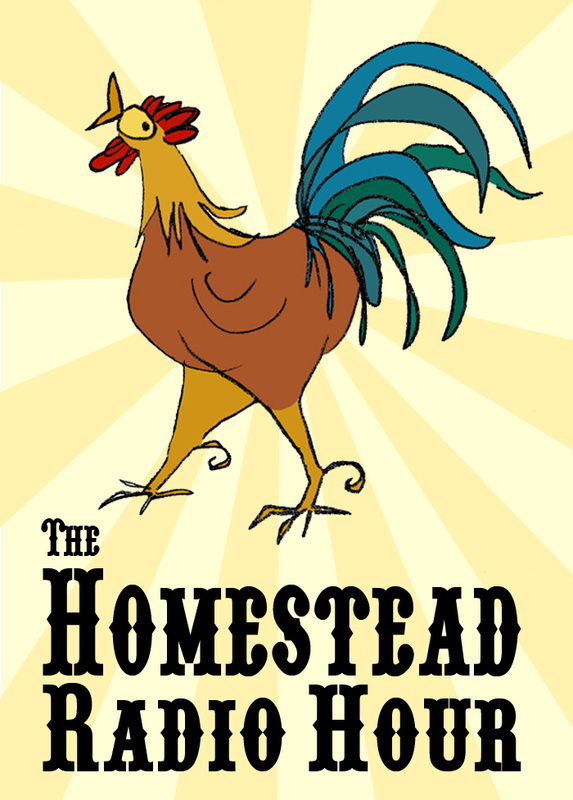 Today we bring you two episodes of The Homestead Radio Hour, our monthly radio program on KVMR FM Nevada City. Over the past few years we’ve been honoured to talk with and interview a wide variety of guests, from farmers and beekeepers to local-food advocates and educators; but no matter what the topic, we always seem to come back to the importance of knowing where your food comes from, knowing the people who grew or raised it, knowing how it was made, and knowing how to do a little more in your own backyard. The two episodes below are especially appropriate, I think, for Independence Day. 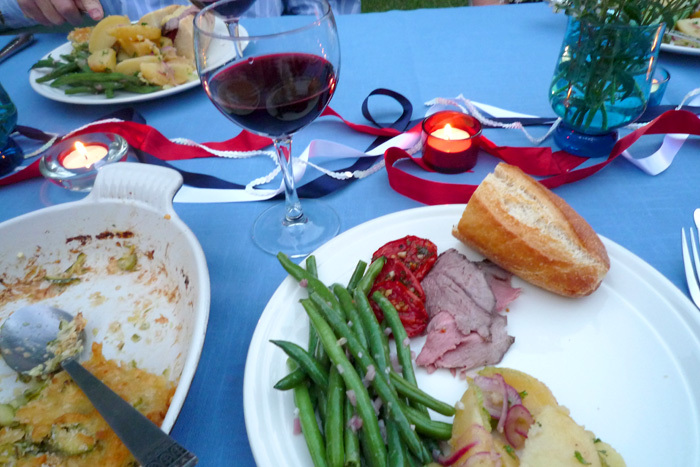 How do we define “independence” when it comes to consumption? Are we really free if we have to rely on a mysterious, all-powerful system of corporations to decide what goes on our dinner tables? And what happens if, one day, that machinery breaks? 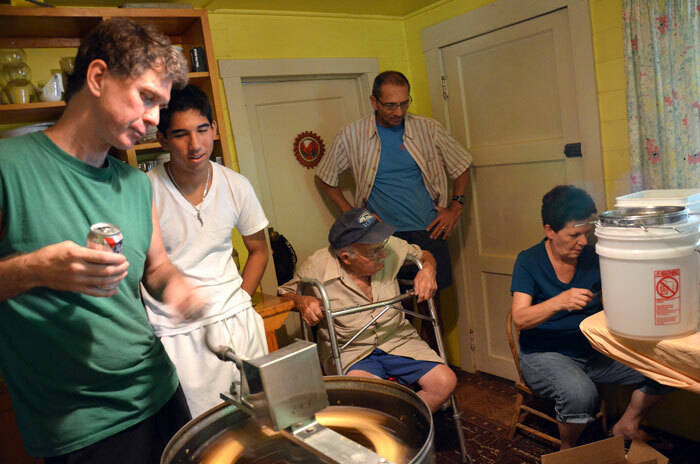 The first episode here — “Independence From The Food Machine” — features local author and real-food advocate Joanne Neft. She started the first Foothill Farmer’s Market in Auburn twenty-two years ago, she has written two beautiful books on how to cook with seasonal, local meats and produce, she has been a tireless advocate for our local farmers and food economy, and that’s just the beginning! Joanne is one of the most inspiring people I know in the world of food and farming, and it was such a treat to sit down with her at the historic Newcastle fruit-packing sheds and talk about the importance, and the joys, of real food. 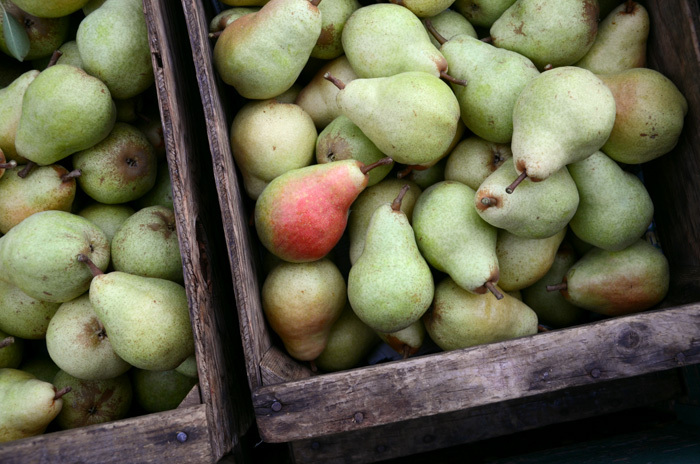 In this episode, we also visit the farmer’s market to talk to shoppers, chefs, and farmers about why they love fresh, local, and seasonal food. The second episode here is one that I still can’t quite believe happened. We were totally knocked out to get to interview Joel Salatin and Michael Ableman, world-renowned farmer-author-activists, on the Homestead Radio Hour back in January. The whole thing came as a complete surprise — we were planning to talk about the Nevada County Farm Conference, where they were going to be featured speakers, but the last thing we expected when we arrived at the studio was to find Messrs. Salatin and Ableman waiting for us! We frantically scribbled down some notes and questions in the few minutes before the show started, but our semi-panicked frenzy was completely unnecessary; they were so down-to-earth and easy to talk with, and it was a delight just hearing the two of them take the conversation in ways we hadn’t even planned. I hope you enjoy these two episodes at your leisure on a lovely summer afternoon, preferably with a tall glass of lemonade or a bowl of icy watermelon — the old-fashioned kind, with seeds. They’re so much sweeter that way! Learn how you can achieve Independence From The Food Machine! 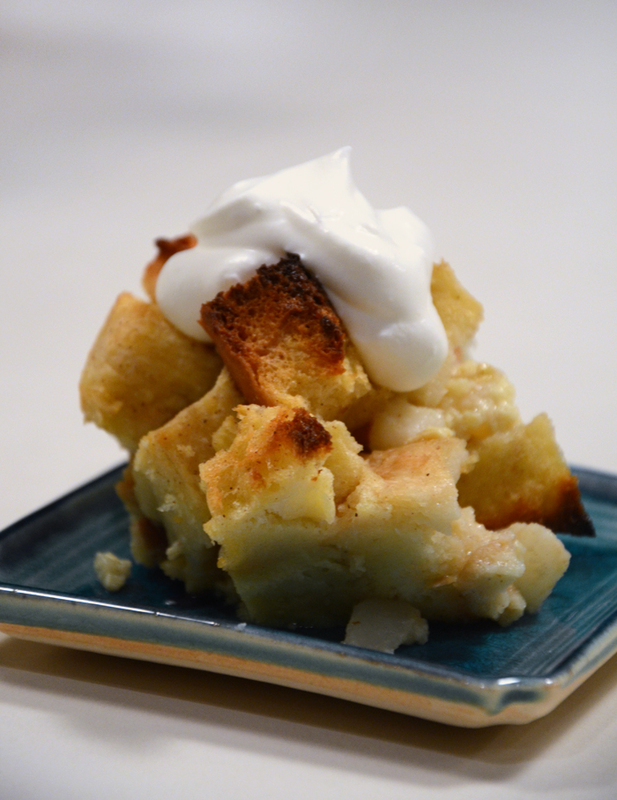 This episode features local farmers, consumers, and chefs, as well as local food advocate and Placer County Real Food Cookbook author Joanne Neft. We talk about the benefits of eating fresh, local, in-season foods and give tips on how to do it without breaking the bank. 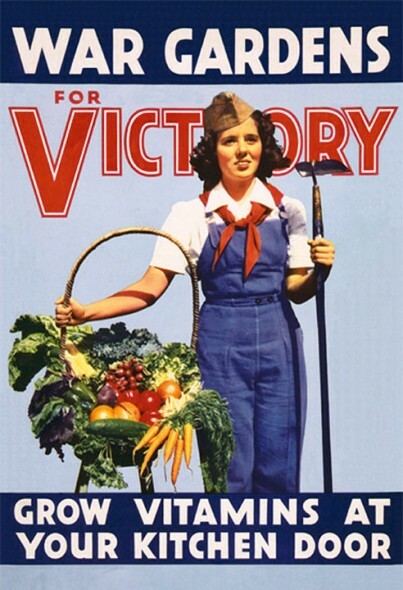 Celebrate the national treasure of small farmers and CSAs, as well your own backyard, and claim your rights to freedom of the fork! Joel Salatin and Michael Ableman visit the Homestead Radio Hour to talk about sustainable agriculture, “integrity food,” and the future of farming. Joel Salatin is a full-time farmer in Virginia’s Shenandoah Valley. A third generation alternative farmer, he returned to the farm full-time in 1982 and continued refining and adding to his parents’ ideas. His speaking and writing reflect dirt-under-the-fingernails experience punctuated with mischievous humor. He passionately defends small farms, local food systems, and the right to opt out of the conventional food paradigm. He is the author of nine books, including The Sheer Ecstasy of Being A Lunatic Farmer and Folks, This Ain’t Normal: A Farmer’s Advice for Happier Hens, Healthier People, and a Better World. Michael Ableman is a farmer, author, and photographer and a recognized practitioner of sustainable agriculture and proponent of regional food systems. He has written several books and numerous essays and articles, and lectures extensively on food, culture, and sustainability worldwide. Michael is currently farming at the Foxglove Farm on Salt Spring Island in British Columbia, home of The Center for Arts, Ecology & Agriculture. 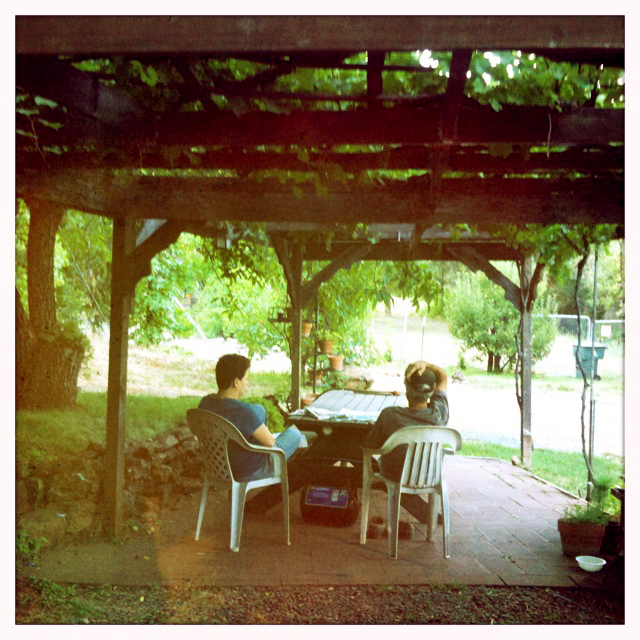 Find more Homestead Radio Hour episodes here on the KVMR Podcast Archive! 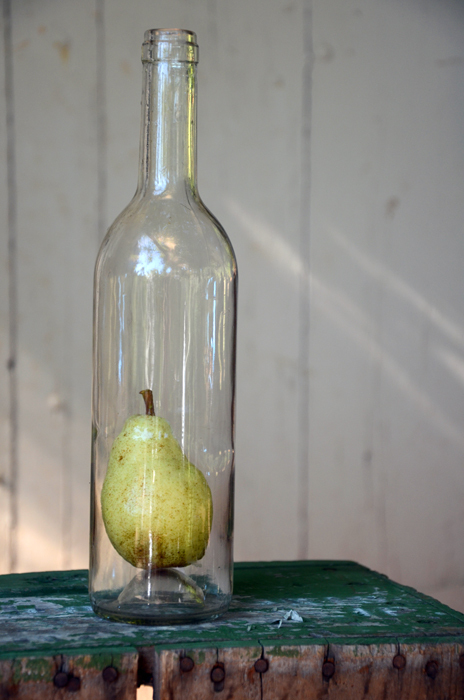 Have you noticed lately how many “new” gardening trends lately are really reflecting ideas that have been around for generations? 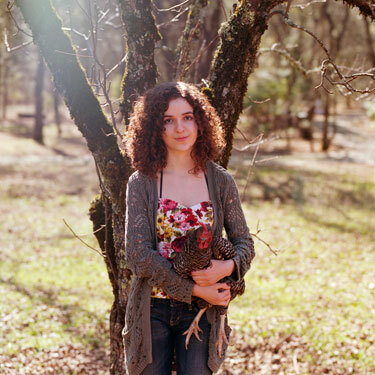 Local food, home gardening, keeping chickens, foraging — our ancestors found these things to be second nature, but so many of these age-old skills were laid aside somewhere along the way in the steady march toward Progress and Modernization. 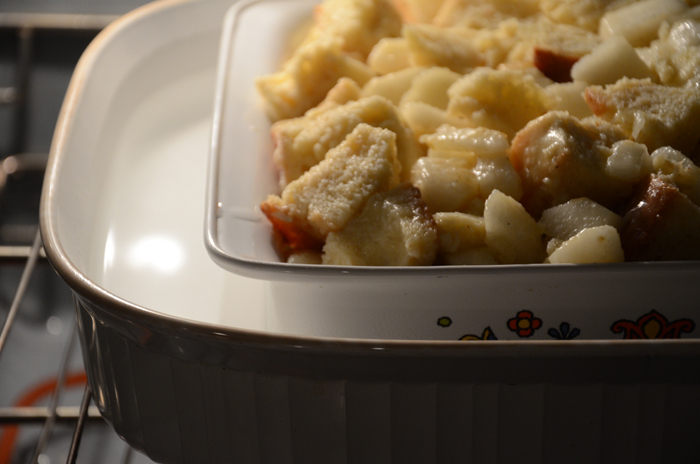 If dinner can arrive neatly packaged in a box and be ready in minutes, who needs to cook? When the grocery store shelves are stocked with anything and everything we could possibly want to eat, why go to all the time and bother of growing our food from a handful of seeds? 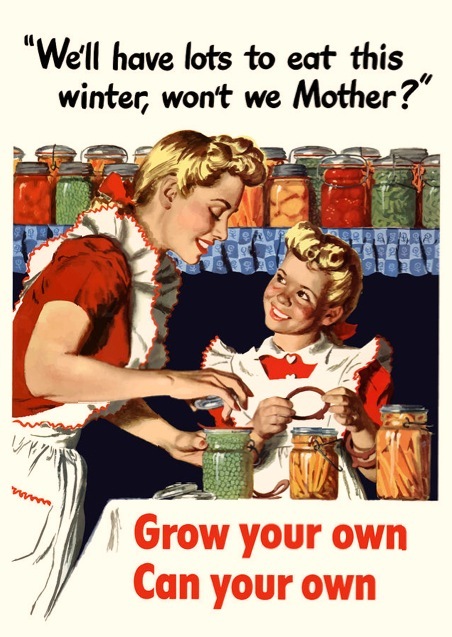 I’ve been seeing more and more wonderful vintage posters and ephemera resurfacing from the heyday of “Victory Gardens” — the home plots that cropped up across Europe and America during the two World Wars to sustain families as food and resources were diverted toward the war efforts. Both supplies and the land to produce them were limited and precious, and so — in a remarkable effort toward encouraging what we would now call “sustainability” — governments began encouraging people to grow their own, and educating them in how to do it. 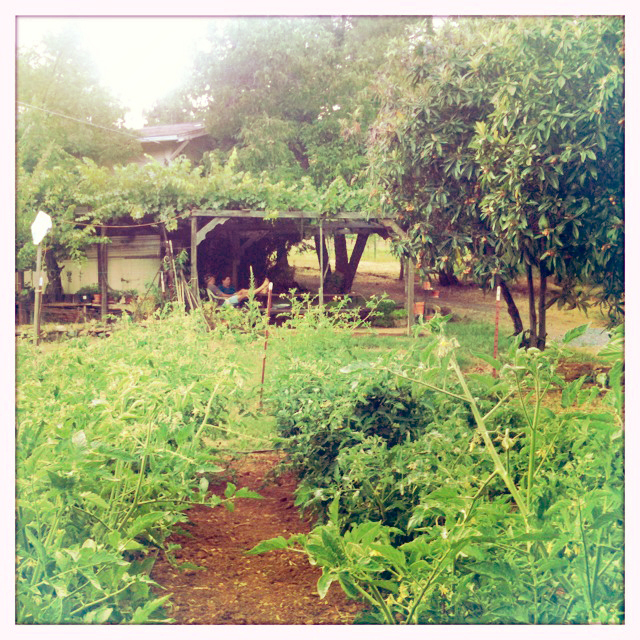 But it’s not just backyard plots that are an old idea turned new. 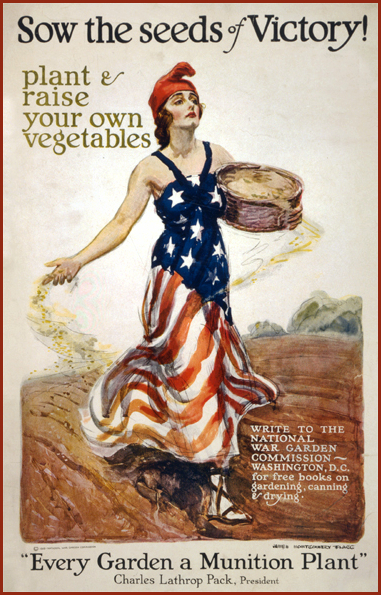 Chicken-keeping, school gardens, canning — all these became patriotic pursuits in wartime. 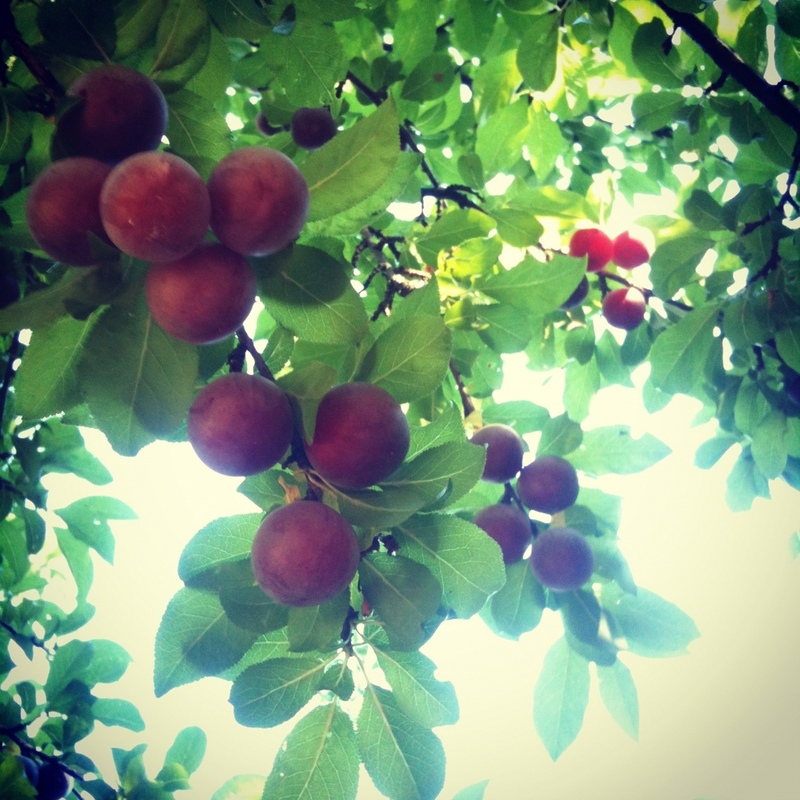 And now, once again, we’re rediscovering the value of producing and preserving our own food. The reasons may have changed, but the satisfaction and joy of harvesting your bounty never go out of date. And as we see our economic and food systems become increasingly unstable, it starts looking live a very good, and necessary, idea indeed. 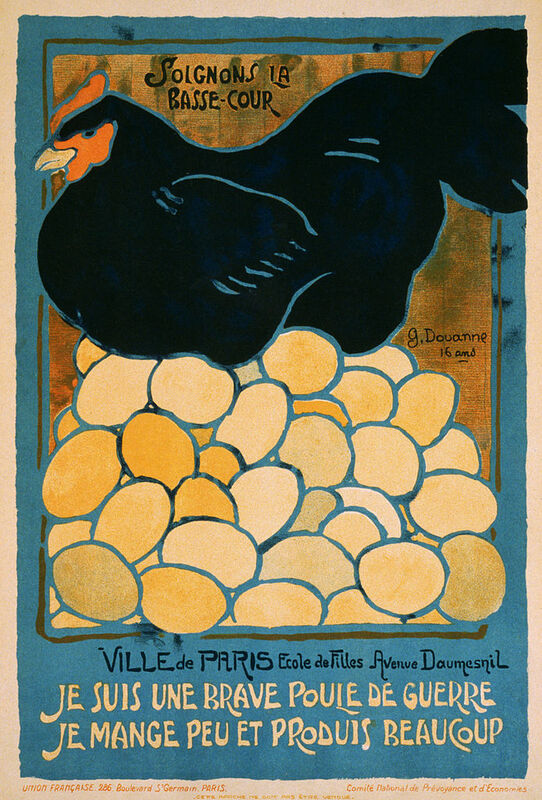 Some of the posters issued to encourage home production are extraordinarily lovely — a tremendous variety of artists, from Harper’s Magazine illustrator Edward Penfield to French schoolchildren, contributed designs to the cause. I think they are just as inspiring today as ever — perhaps even more so because of the history and heritage they represent. 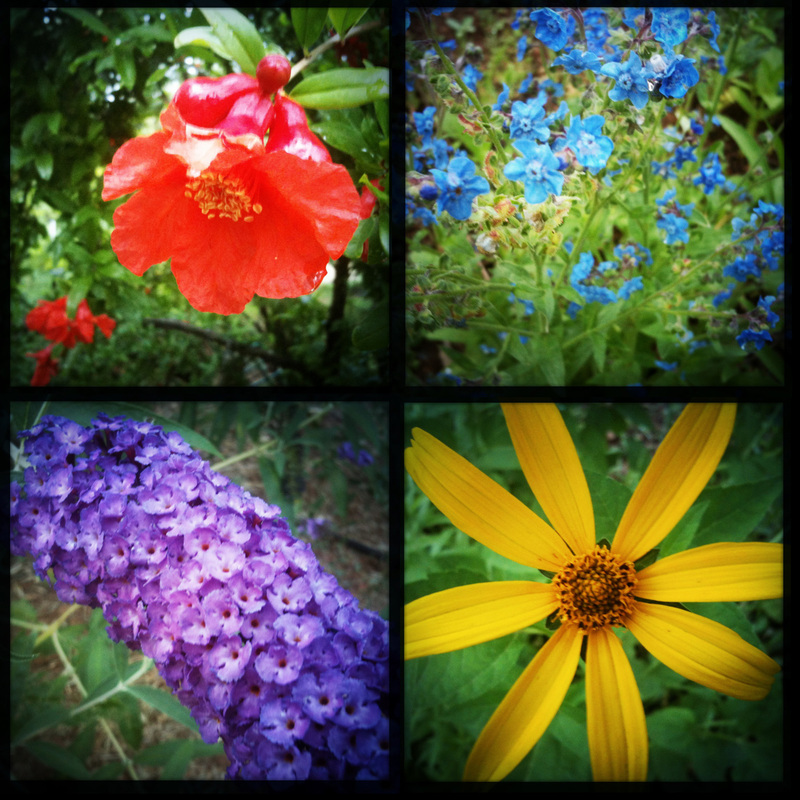 Here is a sampling of those that I’ve collected… enjoy! 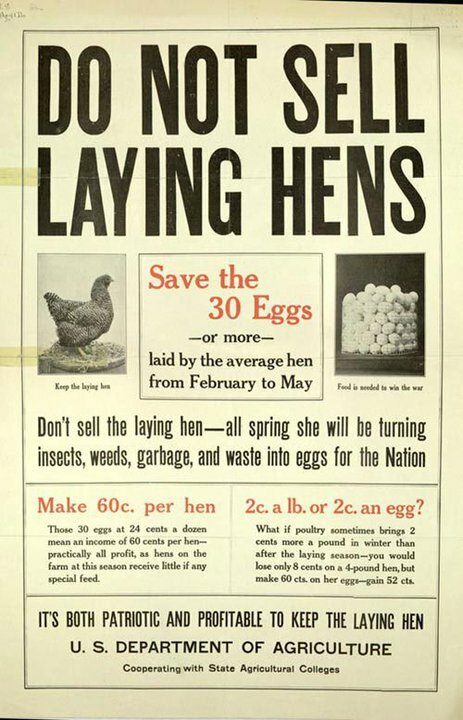 USDA ad, circa 1917: “Don’t sell the laying hen — all spring she will be turning insects, weeds, garbage, and waste into eggs for the Nation… it’s both patriotic and profitable”! Thankfully backyard birds across the country aren’t producing eggs to “win the war” today, but it may be just as important now to learn to produce our own food and be a little more self-sufficient. 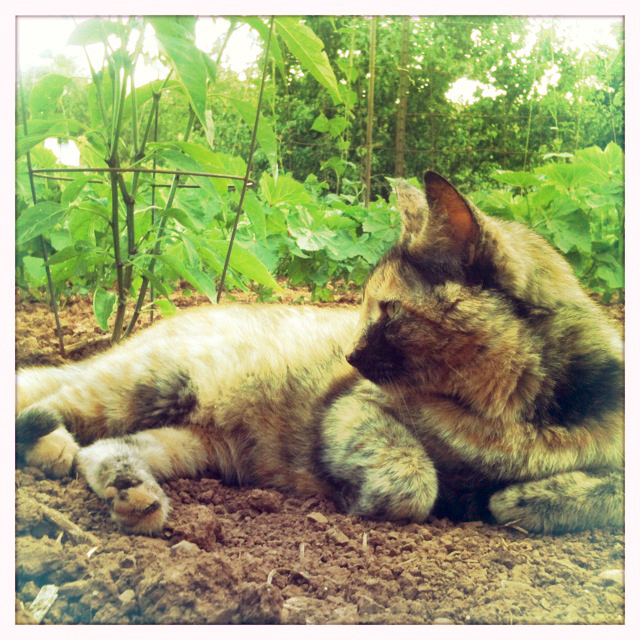 And as “urban farmers” discover the delights of fresh eggs and free fertilizer, the humble chicken reinstates herself as a part of the homestead, one backyard at a time! 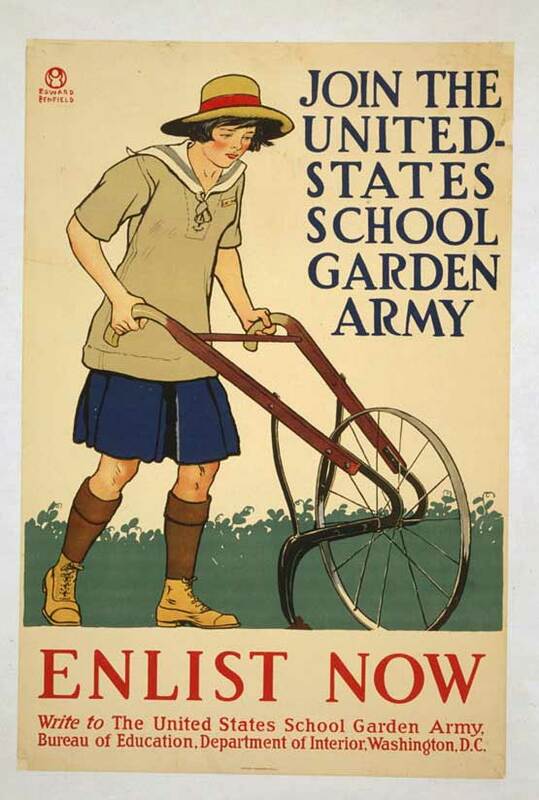 A WWI-era poster by Edward Penfield for the United States School Garden Army. Its motto — “A garden for every child, every child in a garden” — sounds just as relevant today, as school and community gardens pop up across the nation. When the First Lady enlists a troupe of elementary school students to install a kitchen garden — the first since Eleanore Roosevelt’s Victory Garden — in the White House lawn, you know we’re headed in the right direction! “ALONG THE EAST RIVER FRONT: Supervised by competent instructors the school children of New York City produced some excellent results in the gardens which they planted in various sections of the city. 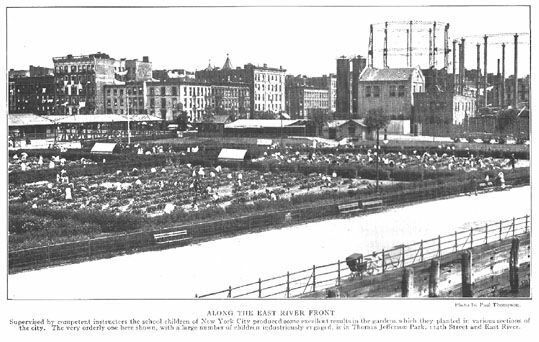 The very orderly one here shown, with a large number of children industriously engaged, is in Thomas Jefferson Park, 114th Street and East River.” I can’t decide which part of this image is the most extraordinary — children planting an eye-popping school garden in 1918? On a vacant lot in New York City? On the East River??? Wow. And if the comparisons to ships and cannon fire weren’t enough motivation for the kids, here’s this 1943 edition of World’s Finest Comics, showing everyone’s favourite superheroes getting down to business! Though I worry that Robin is courting a nasty sunburn… it does look like he’s already in the early phases of heatstroke. 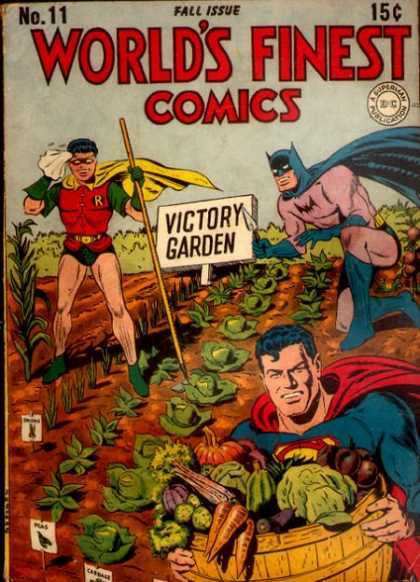 Maybe gardening without pants wasn’t such a super idea after all? “Every month we shall try to do three things : first, we shall remind you of the things that ought to have been done, but may not have been possible because of the weather or for some other reason; secondly, we shall deal with gardening operations for the month; thirdly, we shall look ahead a month or two and remind you of what you need to do in readiness.” The guides are all available online here; click on over to enjoy their charmingly down-to-earth advice! Canning? Yep, we’ve been doing that for a while too! 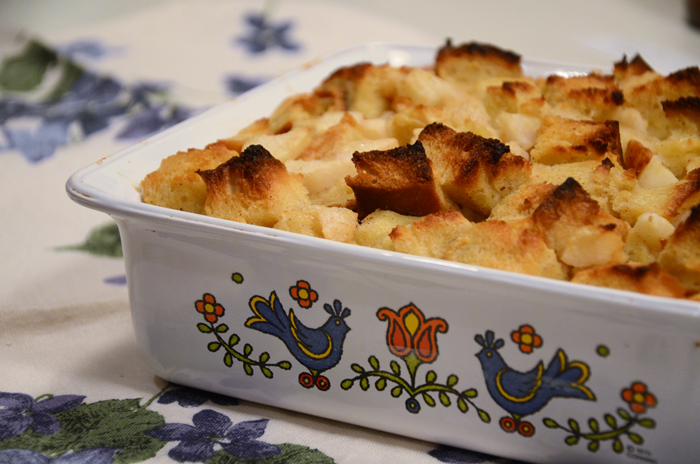 I think I’ll skip the peas, myself… but those frilly rickrack-trimmed aprons? Oh, yes please. 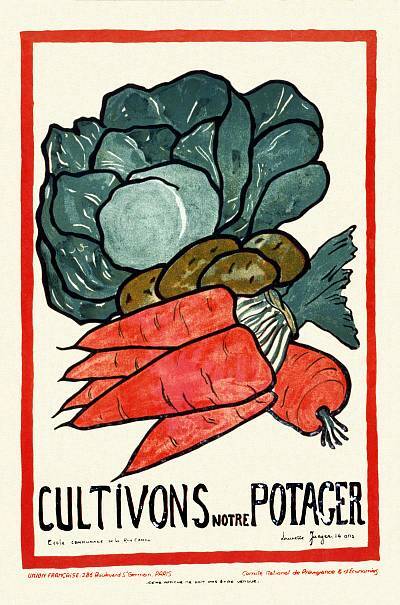 “Let us cultivate our kitchen garden”: A French poster from 1917, by Louisette Jaeger, part of a series designed by school children in support of the war effort. 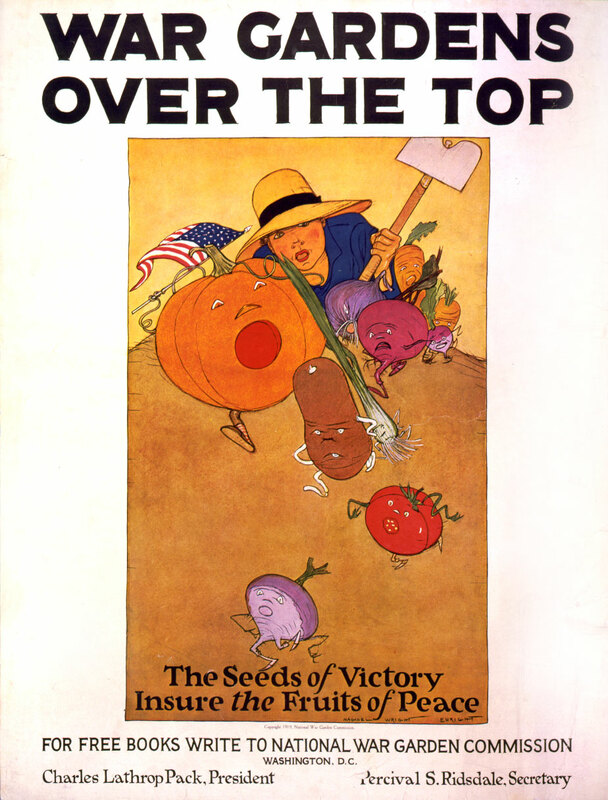 WWI poster by James Montgomery Flagg, 1918, for the National War Garden Commission. Let’s sow the seeds of tradition and independence in our own backyards! 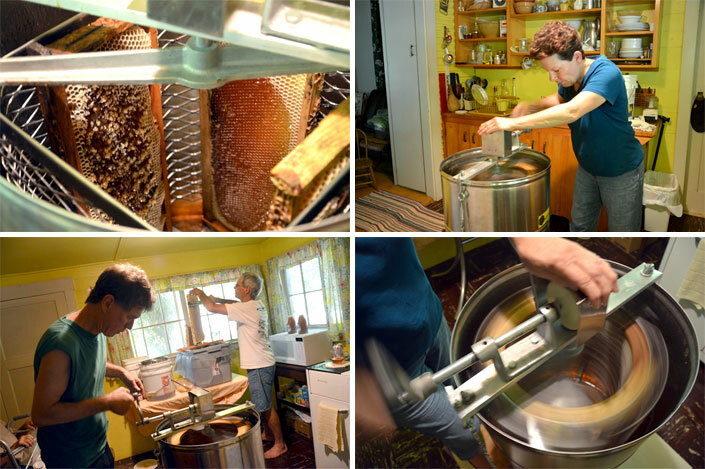 It’s that long-awaited time of year — the honey harvest! 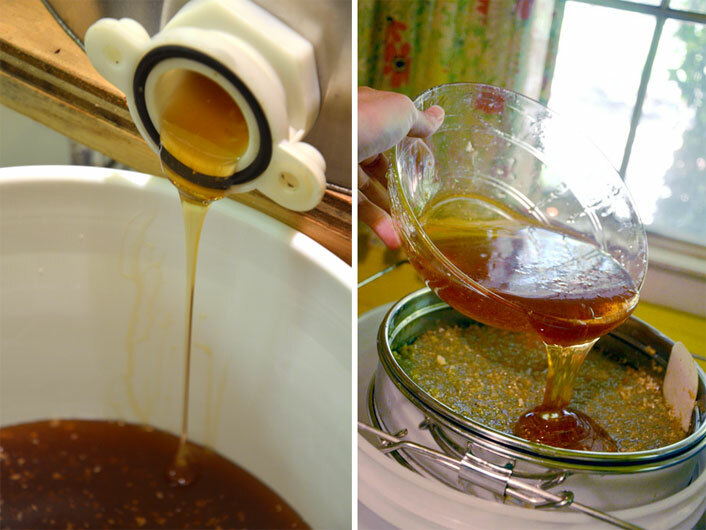 Tomorrow we’ll be up to our elbows (quite literally) in sticky delicious honey, but before the fun can start, there’s work to do… namely, collecting our haul! 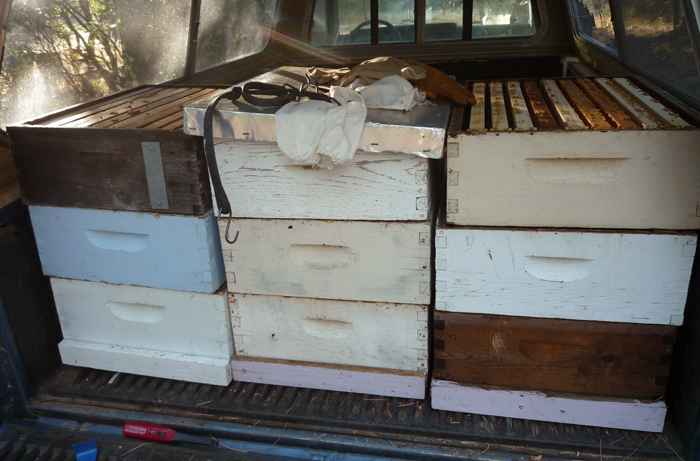 The honey we’ll be extracting is in the shallower boxes, called “supers,” on top of the hives. 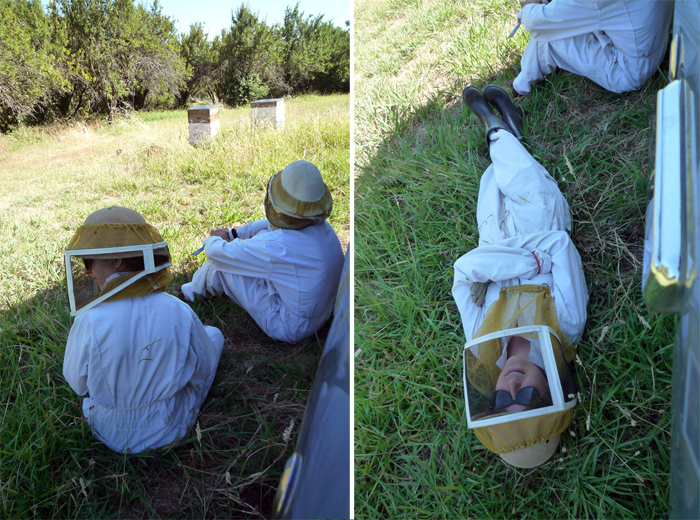 Collecting them would be easy, except for one small problem: they’re full of bees! 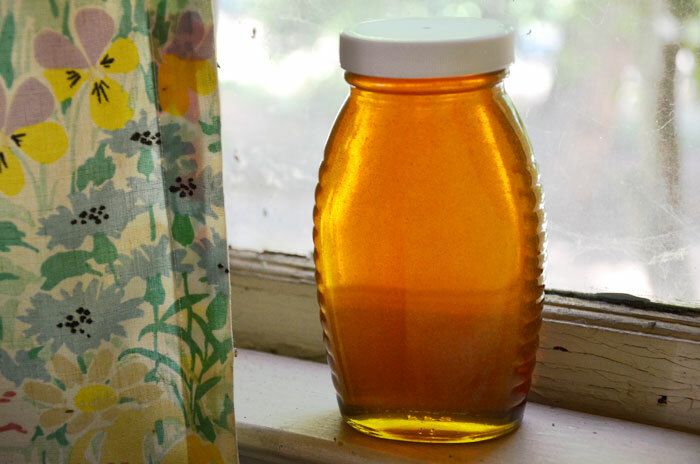 Since we of course don’t want to take the bees back home with us, we start by asking them politely to surrender the honey and head on out of the supers…. well, more or less. 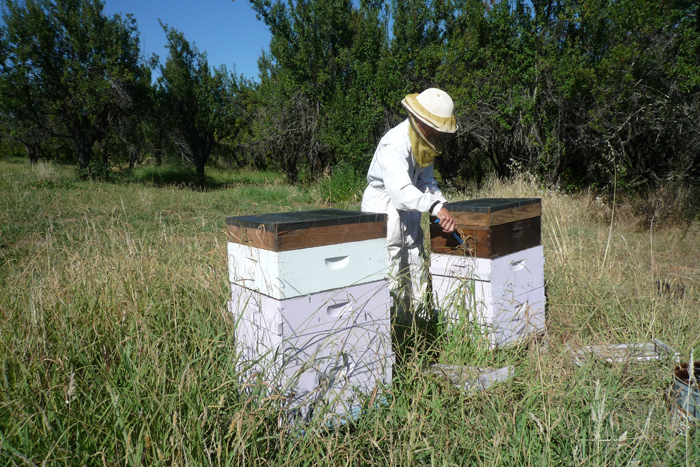 We do get a bit of help in the communication department — see the black-topped little boxes on the hives above? They’re called “fume boards.” (Appealing, I know.) 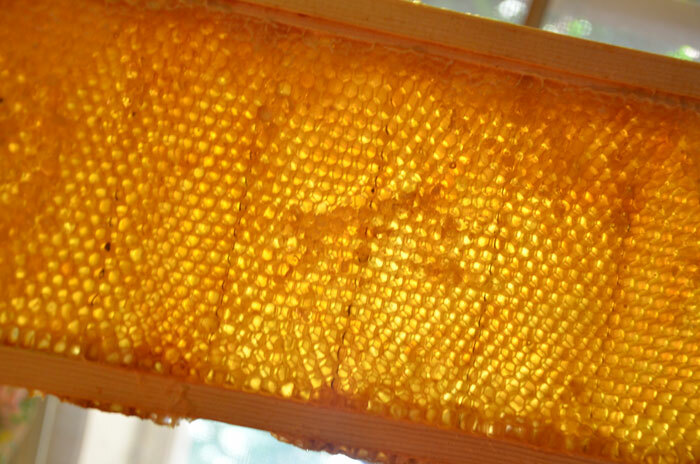 Inside is a sheet of cloth, which we’ve drizzled with a super-stinky solution that the bees absolutely loathe the smell of. Trust me, it’s nasty; I wish I had smell-o-vision here, except that I wouldn’t want to inflict upon you the horrid stench of bubblegum-meets-rotting-socks! 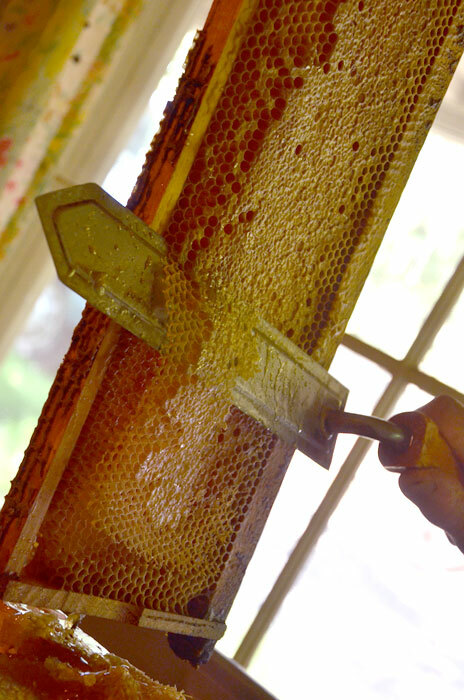 A highly disturbing combination, and one which sends the bees running as quick as they can in the opposite direction — downward into the hive and away from the honey box. 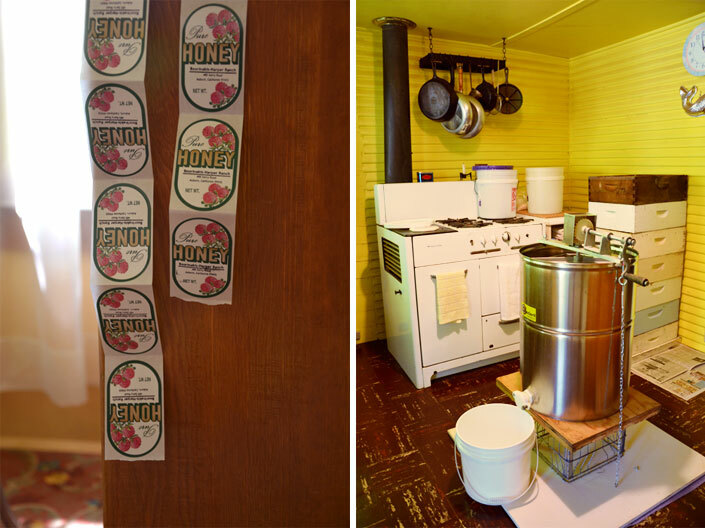 There are a few other methods of accomplishing the same goal, but they usually involve one-way “escape” doors that the bees have to navigate. 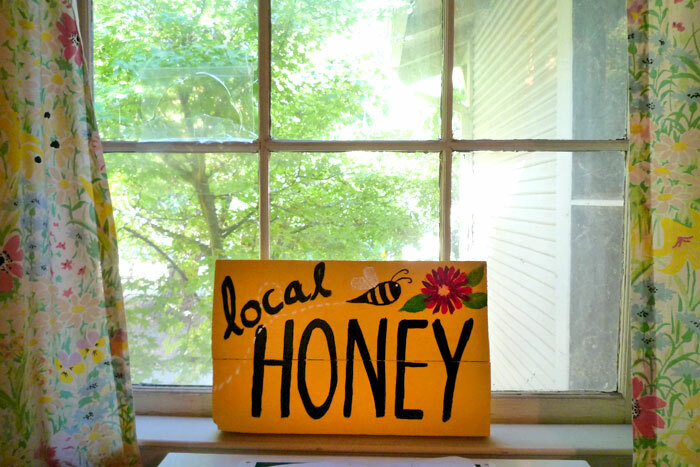 These work, but they can take days, and there are always plenty of unlucky bees that don’t quite get the idea. 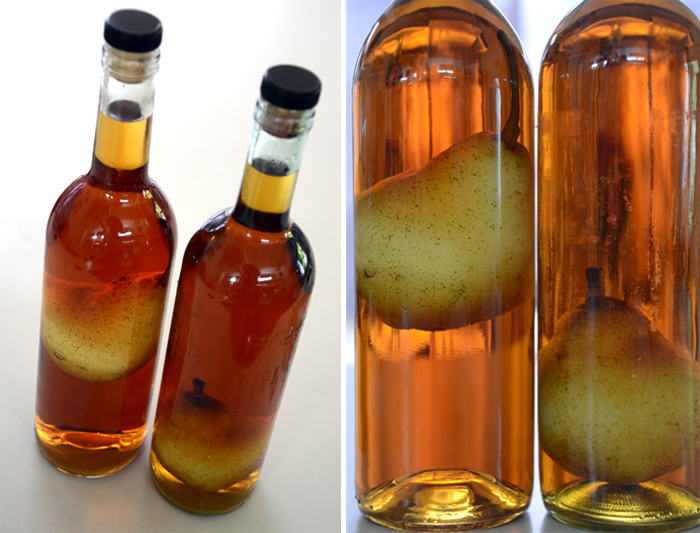 We’ve found the “smelly” trick to be by far the simplest and easiest. We’ll have photos of the spectacularly messy Part 2 soon — stay tuned!